There is nothing better than sitting down for a fine meal and be served a large helping of seafood risotto. This Italian staple can be made with a variety of flavors and its smooth creaminess never fails to impress. The interesting thing about risotto is that it was never intended to be this delicious, the entire dish was supposed to be a joke. Rice was brought to Italy and Spain by the Arabs in the fourteenth century and it was discovered that the climate was perfect for the growth of the gain. Soon rice became a main staple of the region and there were many wonderful recipes that followed. In 1574 there was a glass craftsman that was creating stained glass for a church that was being built. There was some question as to the materials he was using and he was being teased. As a way to get back at these people for teasing him, he made a rice dish loaded with saffron, intending to make them all sick, instead they all found it very tasty and risotto was born. Later Italian seafood was added and Italian seafood risotto was introduced to the world. Today risotto is made with a variety of different types of rice; Arborio, carnaroli, padano, and vialone nano. These are short grain rice that has the high starch content needed to create seafood risotto. To make a risotto you first sauté the rice with onions, garlic, butter and olive oil, then over a low heat you add white wine to the rice and allow the rice to absorb the liquid. Next, very hot seafood stock is added in small amounts and the heat is raised. Risotto must be constantly stirred at this point in order to release all the starch from the rice, once a creamy consistency is reached, the risotto is taken from the heat and cold butter is added in order to improve the creaminess. For other forms of risotto grated cheese would be added, but in Italian cooking seafood and cheese are never mixed, so for risotto you add no cheese. 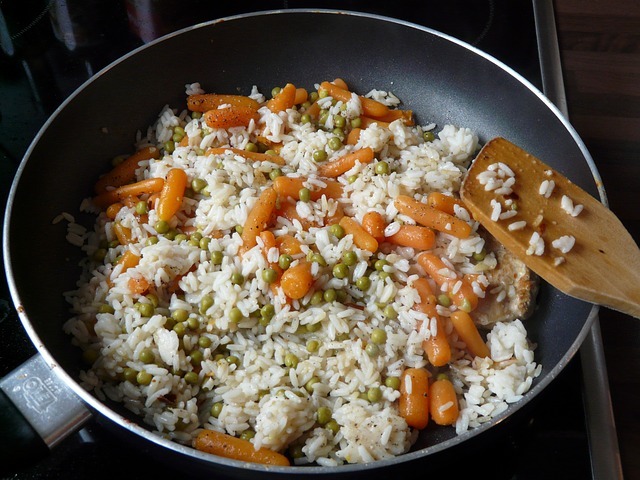 Your risotto needs to be eaten while it is hot because as it cools the starch causes it to clump together. Also you need to cook your seafood risotto until it is just liquid enough to spread out on a plate, but is has no extra liquid. Whether you decide to make your own risotto or head out to your favorite dining experience there is nothing that can touch the taste of the perfect risotto. The creamy rice and wonderful flavor is always the perfect beginning to the perfect meal. Seafood risotto is considered one of the staples of Italian cooking, but do not hesitate to try other flavors, you know that a risotto is going to make your pallet happy. Rodney is a seafood risotto lover who has always loved talking about it. Check out my blog about Seafood Risotto for amazing seafood risotto recipes. SeaFoodRisottoRecipes.